I had a post a while back showing a Golf Tee Matchbook using a project angel Rita Kegg has on the Scor-Pal site. Well, I altered the pattern a bit so the cover actually holds the tees in the book. The main cover for mine is 2 1/2" x about 10". I scored at 2", 2 1/2", 4 1/2" 71/8" (must move the cardstock a bit and score at 7") and a 1/2" from the 7 1/8" score. 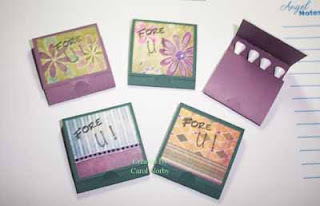 These samples use Mulberry Meadow SWIC (being retired) pattern pieces cut to fit the cover. I also used my Basic Grey Notch Tool to make the notch that holds the cover. The top center matchbook I added a little matching paper posie in the center of the large flower. The bottom left matchbook has a bit of matching ribbon from my stash. All use the Fore! stamp set but I used a retired set for the U!. The Kinder-Bet set works fine but it was just a bit larger than I wanted at this time. I stamped the texts with Palette Hybrid Noir ink. I think any of TAC™'s wonderful paper collections and cardstocks would make this a great gift project or craft fair item.